Hey lookie...I made a tree! It's the little things in life that make me happy...like having a thought in the middle of the day and seeing it work out perfectly in the evening. That doesn't happen often but it's pure joy when it does and makes all the other not so perfect times fade into the background. The idea for today's tree actually came from a Donna Downey online class I took a few months ago where she used her fingers to paint some flowers. I figured if Donna could make flowers I could make leaves, right? Here's how I created these art journal pages. 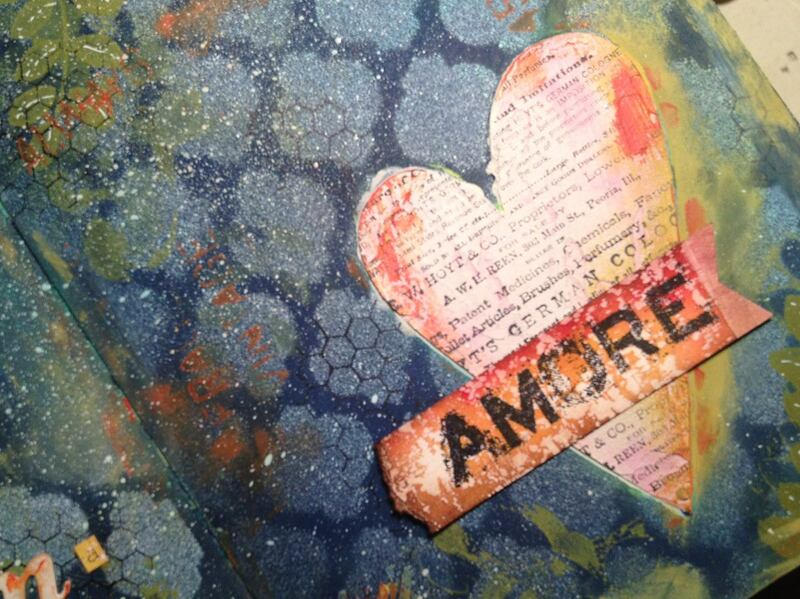 I started by slapping some Distress Paints onto two of my art journal pages. I used water to wet down the pages, before applying the paint, and then used my fingers to move the paint around (the journal pages absorb the water quickly so you don't get quite as much movement from the paint as you would on a smaller surface, like a tag). Once the paint was dry there was a tree shape on the left page...see it? I drew a rough outline so I'd know where to put the tree and then got busy with more paint! I painted the tree trunk first, using Golden paint as a base and then adding a few swipes of other colors (yellow/white) to give the tree a bit more texture. (Links to all products at the bottom of my post). I used White Linen ink spray with the Blazonry stencil, you can just barely see the design in the background, and then the Chevron stencil with more yellow paint. During Dina Wakley's class, taken a few weeks ago, she recommended staying in the same color family when adding colors and that's what I did with this page. It was the perfect recommendation and really helped me keep this page from getting too crazy as there were already enough colors in the background. At this point...I needed black! So I used a Wendy Vecchi stencil and Black Soot Distress Ink to add the words and numbers. Love this stencil! I added a sentiment, using letter stickers, and a Grow tag (stamp from a Wendy Vecchi set, link below) with the date. Using the half a tag for a date is totally a Donna Downey thing but I adore it so Donna...don't hate me because I've stolen your idea...it's fabulous and I love it! Oh yeah...and then I needed splats of colors...but of course! The deep orange is watered down acrylic paint that I picked up with a brush and flicked all over both pages. Love that splatter!! And that, my friends, is how an idea turned into reality!! Enjoy!! Links below! Hi gang! Sorry I've been MIA again! Life and the running of a business sure does get in the way of my creative time!! However, I did manage to sneak into the studio this week to create a short video on using Remnant Rubs! You can check out the video here and I'll list the products I used on this project below! Enjoy! Oh boy...big post today! I may keep it light on words and heavy on pictures...'cause it's the pictures everyone comes to see, right? :-) There's also a video at the end of today's post! My next project is a super bright and kind of busy art journal spread....but I'm ok with the brightness...it's all girly!! I started by using the same gesso resist and stencil technique mentioned in the video and then I added the Dylusions Ink Sprays. I then added some design by using the Wendy Vecchi Brick Wall stencil and more Dylusions Ink Spray (Dirty Martini). I then added both girls, using the Flossie stencil from Dyan...there was a bunch of masking going on - yes, a video is in there somewhere - with both of these girls...some techniques we learned at the retailer show a few weeks ago. I then added text (a stamp) and a stencil design to both girls (love the text over the flowers...fabulous) and outlined them with a black marker so they would show up better...since all of my colors were in the same color family. And those white dots? Thanks to Dyan (her idea) and a gel pen...I LOVE this look and am seriously going to be adding white gel pen dots to all of my future creations! I then added a bit more stenciling, using another Crafters Workshop stencil and some Black Soot Distress Ink. Before adding the sentiment, I added a bunch of leaves from a Dyan stamp set (link below) and colored in the leaves with Dylusions Ink Spray and a paint brush. (Yes, more white dots on the leaves!) The ink sprays are a great coloring tool and I love how you can see the color on the leaves but you can also see the stencils and gesso underneath...fun stuff! OK - on to the links and video, both listed below! Enjoy! Say it isn't over!! I hope you've had an amazing few days following all of the beautiful Sweet 'n Sassy creations! 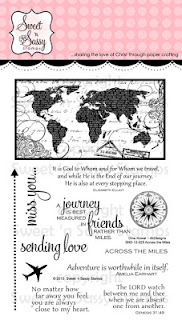 This is our last day and today we're showcasing the Across the Miles stamp set. It's darling, love the travel them, and the wee little plane...isn't is fantastic! And wait until you see the entire set, shown below, it's wonderful!! For my card, I employed a little gesso resist technique, which is something I've been showcasing in some videos over the past few weeks. For this card I actually used gesso as an ink for the stamps. I used stamp 'n press foam to load the gesso onto the stamp and then stamped directly onto a piece of manila. Once the gesso was dry, I put some Distress Stain on my craft sheet and ran the manila through the stain. The gesso resists the stain! Love that! (You can see the entire technique here) I then added the fun arrow, which you can bend because it's acrylic (love that!) and plane. 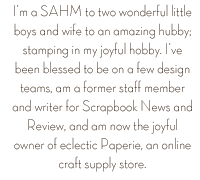 A piece of embossed cardstock and the sentiment were the finishing touches! Welcome to Day Three of the Sweet 'n Sassy Release Celebration!! Are you having the greatest time ever? Oh, how I love release time and I love seeing all of the amazing creations from the design team. Art certainly is fun stuff!! Today we're showcasing the new Buggin' Ya set...how cute is this set? 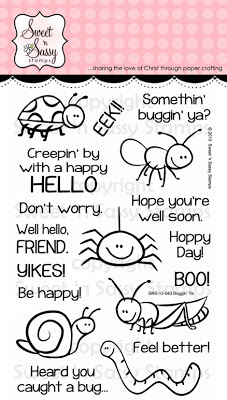 A whole lotta darling bugs combined with sweet buggie sentiments. Darling! I decided to show off four of the six creepies (only the lady bug is really adorable in real life...but Korin sure has made them all look sweet!) on my card. I started by punching out four 1" squares, stamping the sentiments with Memento ink, and coloring them with Copics. The white squares were then mounted on 1 1/4" squares and the rest of the card was created using this pretty paper from Authentique (the Grace collection). Here's the entire stamp set and more details about the hop and links to the other design team members are listed below. Korin shares, "As a mother of three boys, creepy crawlies have been a part of my life for many years, so this set is for all those boy moms, grandmas, aunts and babysitters who know what it's like to find critters in pockets or hear that sweet voice asking for a container where he can keep his "new friend". I have to say, if creepy crawlies my boys brought home were this cute, I might not have been so hesitant to oblige their request." Welcome to the first day of the Sweet 'n Sassy release week! Super exciting stuff this month...seriously, these stamp sets are amazing! I almost had a hard time creating a card as I had so many ideas! Korin shared that when she was designing the set, she kept adding more and more and more...I think she's covered almost every location on the planet with this one. 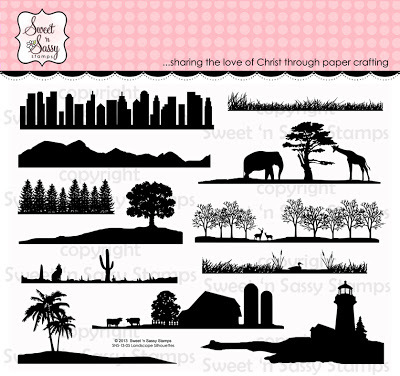 It even coordinates very well with many of the other Sweet 'n Sassy silhouette sets. Hi everyone! I'm back today with an art journal project, and a video, where I demonstrate another gesso resist technique...this one is where I use gesso as an ink for stamps. Fun stuff! (Tim Holtz demonstrated this technique at a retailer event that I attended a few weeks ago). And...I'm working on my courage, showing you (in a big 'ol picture I might add) my very first face drawing. Ugh...it needs work but I finished...I did it, I drew something by hand (me, who can barely draw a stick figure), and I'm super excited about continuing to learn and experiment! I do have to give a huge shout out to the following two ladies, who are the ones who provided a ton of inspiration and help when it came to some of the smaller details....Donna Downey, who just started drawing faces and her videos were a great help in pushing me to give it a try and Tamara Laporte, who is an artist I just stumbled upon (thank you Dyan Reaveley!) and I adore her art! Her faces are amazing and I love the colors she uses...purples and blues in the hair...stunning! I started by using gesso as an ink and then stamping with the Collage of Digits images all over two pages in my Dylusions journal (the video will provide you with step-by-step instruction on how to use the gesso). Then I grabbed three Distress Stains (Spiced Maralade, Dusty Concord, & Broken China) and "scribbled" all over both pages. A good spritz of water helped the colors to blend. Once the pages were dry, I used my hand and more water to create the droplets. And then I started sketching the face! I started by using a charcoal pencil, which blends a bit when you go over it with paint (I used Golden Liquid Acrylics and Adirondack paint) but I like that extra shading bit. I then filled in my face with a mixture of Titan Buff and Yellow Ochre and added the features. Note...it's super hard to get the eyes the same size and once I'd finished I realized my lips were off center...had to repaint them! I have a whole new appreciation for people who have nature drawing talent...it's super hard! Once the face was complete, I painted the hair and added a shirt. Then I added this great quote! Notes for next time...my eyes are huge, as are my lips, need to make both smaller. Need to work on the hair...it looks too flat or something, it needs more movement. Maybe next time I'll just go for one of those no-feature faces...yeah, I like that idea...LOL! Here's my produce list and the video link is below the list (feel free to email me with any questions at kim@eclecticpaperie.com). I created a video demonstrating the gesso resist-stamping technique. Check it out below! For your reference, it's also posted in the eClassroom where you can also check out our other videos. Enjoy! First things first...I have to just share this...I LOVE, LOVE, LOVE my art journal! Creating in it is seriously one of the most fun things ever! I am having a blast! If you think art journaling isn't up your alley or that you're not very good at it...then this post is for you! Here are my ugly pages...in all their glory! LOL! OK, maybe they're not ugly but it might seem obvious that this is one of my first attempts at art journaling. I didn't really know how to work well with ink sprays, as evidenced by those big blue spots (lack of water and blending). My color choice is well...a bit lacking and I'm not even sure where I was going with any sort of design. I was basically trying out a bunch of products on these two pages; stencils, embossing paste, and ink sprays...and I wasn't very happy with the results. My new design all started with this month's challenge on the Wendy Vecchi fan board...the challenge was to stamp through a stencil or to use a stencil as a mask. I knew I had these pages, with that sweet stenciled heart, already sitting in my studio but what to do with the pages and how to make it work with the challenge. 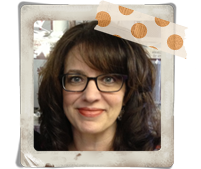 As I sat staring at my pages, I spied a photo of Wendy's projects on the page that comes with her stamp sets, and one of her projects included a pretty cream-colored heart. That was all I needed to get the wheels turning! I grabbed my acrylic paints (since I needed good coverage) and got to work! You'll see all of my steps in the video but I basically covered the entire piece with dark blue acrylic paint (I'll link all of my products at the end of the post) and started over...adding new stencils, colors, and a quote (this made me think of my sweet hubby...who really is better than what I ever dreamed a partner could be). Once I finished covering the pages, I finally pulled out the large heart stencil, to use as a mask, and using a text stamp from Wendy, added my stamped image through the stencil! Challenge completed! And here's the finished project! I love the deep color and the accent of yellow and orange...and hey, I even used a piece of the gesso resist paper from last week's project for the sentiment...perfect colors on that piece of scrap paper (that would be because I tend to gravitate to the same colors on all of my projects! LOL!) I was so happy with the finished product, not so much because of the design but because I was able to salvage those pages that I wasn't that crazy about...and create something that reminds me of my husband. At the end of the day it's all creating what makes you happy and enjoying the journey of experimenting with different products and techniques. Such a joyful experience! Here's a quick list of what I used on this page and the video can be found right after the product list. Enjoy! !